Need for More Identification in 2018? By admin on May 16, 2017 Comments Off on Need for More Identification in 2018? A sign found in Boston’s Logan International Airport on Thursday of last week. The photo was made by a friend of the Advertiser family. 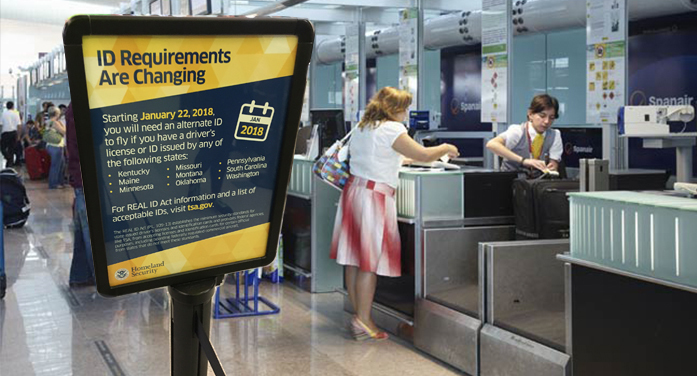 It speaks to a second ID that people who fly will have to have beginning in January 2018. It reads: “Starting January 22, 2018, you will need an alternate ID to fly if you have a driver’s license or KD issued by any of the following states.” Nine states are named and South Carolina is one of those. There is pending legislation before the SC House that will upgrade SC Driver’s Licenses so that they will be complain with the new Federal rules.